Atlanta has the widest gap in breast cancer mortality rates between African American women and white women of any US city, with 44 black patients per 100,000 residents dying compared with 20 per 100,000 white women, according to a study in the journal Cancer Epidemiology in 2016. It is the city with the nation’s highest death rate for black men with prostate cancer, with a rate of 49.7 deaths per 100,000 residents. The mortality rate for white men there is 19.3, the National Cancer Institute reports. There’s a 12-year or greater difference in life span among neighborhoods in Fulton County, of which Atlanta is the county seat. Those living in the city’s Bankhead or Northwest neighborhoods, which are predominantly black, fare worse when compared to those who live in affluent, mainly white Buckhead, researchers at Virginia Commonwealth University found. 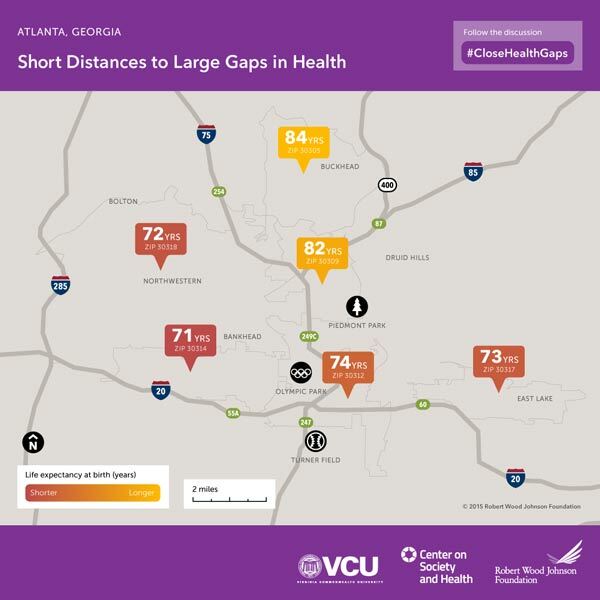 Large gaps in mortality exist between African Americans and whites in such diseases as HIV, stroke, and diabetes, according to the Georgia Department of Public Health. “I think we should be further along in Atlanta, but I think we should be further along in all cities in this country,” says Dr. David Satcher, a former US surgeon general and founding director of the Satcher Health Leadership Institute at Morehouse School of Medicine. “We have world-class health care facilities in Atlanta, but the challenge is that we’re still seeing worse outcomes” for Blacks, says Kathryn Lawler, executive director of the Atlanta Regional Collaborative for Health Improvement. “Atlanta spends $11 billion on health care in a given year, but much of that is misspent,” she adds. Anderson adds that while Blacks “make up just over half of the city’s residents…. 80 percent of Black children…live in neighborhoods with high concentrations of poverty, which often have poor access to quality medical care, while six percent of white children do.” For its part, NCRP noted that since 2000, the number of high-poverty neighborhoods in Atlanta has tripled, even as the city became wealthier. How to respond? It is notable that NCRP recommendations for philanthropy in Atlanta issued earlier this year and the strategies that leading public health practitioners recommended last year both focus on empowering community groups and fostering a sense of agency. NCRP also emphasizes that philanthropic funding of community groups, to be effective, must be based on a relationship of trust that enables community groups to enjoy long-term operating support. NFL players’ social activism comes in many forms. For Kenny Stills, it manifests as respect for the grassroots leaders of the American South.